By the end of the 19th Century, fine dining restaurants had become part of the landscape for the wealthy aristocratic Europeans and upper-class Americans. These groups transformed eating out into an art form. Through the 20th century, restaurants continued to evolve through two world wars and the Great Depression. The 1950s saw the rapid growth of fast food, while the 1960s marked the beginning of casual family dining and chain restaurants. By 2000, more and more families were dining out on a weekly basis. The rapid growth of travel through the 19th Century thanks to railways and steamships meant more people began traveling greater distances. This, in turn, increased the need for restaurants. Building on the early success of fine dining restaurants in Paris, a new style of dining became the norm in Europe and the United States. Patrons dined at private tables, chose their meals from an a la carte menu and paid their check at the end of the meal. Advancements in science and technology during the early 20th Century directly influenced the restaurant industry. With the discovery of germs and the link between health and hygiene, a greater emphasis on cleanliness led to the rise of two popular hamburger chains: White Castle and White Tower. Their all-white interiors were meant to reassure customers that their food was prepared in a safe, modern, sterile environment. The biggest change in the restaurant industry during the 20th Century came with McDonald's. Originally a hot dog stand owned by two brothers from Illinois, they switched to hamburgers in 1948. Taking a cue from Henry Ford’s assembly line concept, the McDonald brothers began offering the fastest, cheapest food possible by employing low skill workers to assemble it. While the brothers were successful at serving food efficiently and inexpensively, they were not so good at franchising. A restaurant equipment salesman by the name of Ray Kroc saw the potential in the McDonalds concept, buying the brothers out in 1954. His formula for franchising set a precedent for fast food chains, changing the landscape of American dining. 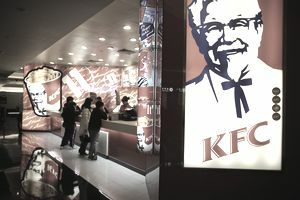 Through the 1950s and 1960s, more franchise restaurants began popping up – many with ethnic themes such as Taco Bell, Kentucky Fried Chicken, and Pizza Hut. Indeed pizza took the US by Storm in the 1950s, and today is considered as American as apple pie. Pizza Hut was the first to perfect the assembly line for pizza. By the 1990s, with many families headed by two working parents, shifting consumer patterns brought an increase in the number of people eating out. Restaurant chains like Olive Garden, Applebee’s, and 99 catered to the ever growing middle class, offering moderately priced meals and children’s menus. This family-style casual dining continues to be a popular restaurant concept today. During the 1980s, 1990s and early 2000s, Americans waistline increased right along with dining out. As the obesity epidemic continued through the first decade of the 21st Century, public health agencies called on restaurants to reform their menus. Critics blamed restaurants huge portions, unhealthy foods high in fat and sodium for the obesity crisis that plagued America. In response, many larger restaurant chains began offering healthier meals, including improved children’s menus. With the introduction of menu labeling, more and more restaurants are seeking healthier options to include on their menus. Along with concerns about the health of the food being served, many Americans were focused on where their food was coming from. In its annual What’s Hot Chef Survey, the National Restaurant Association reported that one of the top 10 trends of 2011 were local and organic foods, indicating that consumers are more concerned than ever about what they are eating.